Aftermarket demand for automotive components in North America is forecast to expand 2.4% per year through 2021, promoted by growth in the size and average age of the light vehicle park; gains in the average number of miles driven annually; increasingly stringent regulation regarding emissions, fuel efficiency, hazardous materials, and occupant and pedestrian safety, boosting the number and value of many automotive components; and rising incidence of insurance among drivers across the region. 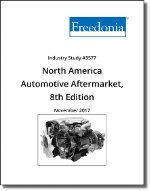 This study analyzes the North American aftermarket for automotive components. Here “automotive” denotes light vehicles (i.e., passenger cars, light trucks, and vans). The aftermarket represents parts and components installed after the vehicle has left the factory. In this study, North America comprises the United States, Canada, and Mexico. All product sales figures provided in this report are given at the manufacturers’ level and do not include wholesale or retail mark-ups or installation costs. However, remanufactured and rebuilt components are included in the scope of this report. To distinguish between parts that are produced by the original equipment manufacturer and those that are made by other companies, many automotive parts suppliers label the former as “OEM parts” or “OEM replacement parts”, while the latter are often referred to as “aftermarket parts”. In addition, parts made by a vehicle manufacturer’s OEM component supplier that are installed by dealer repair departments are sometimes referred to as original equipment service or original equipment supplier (OES) parts. For the purposes of this report, OEM replacement parts, OES parts, and aftermarket parts are all included in the automotive aftermarket, as long as these parts are utilized to repair or upgrade light vehicles in use. Furthermore, sales are attributed to the final purchaser, rather than the installer. Thus, an OEM replacement component that is sold by the automaker to a dealer and then resold to a local garage for installation would be included under garages and service stations, with the automotive dealer in this case serving as a distributor of the part. Similarly, a part purchased by a consumer but installed by a third party is considered to be a consumer/DIY sale. Aftermarket demand for automotive components is examined by product category and segment, country, and major aftermarket service performer (garages and service stations, automobile dealerships, specialists, other professionals, and consumers/do-it-yourselfers) in US dollars. Historical data for 2006, 2011, and 2016 and forecasts for 2021 are presented in current US dollars. Historical data is adjusted to account for fluctuations in exchange rates; forecasts are thus not adjusted.